The map shows the current plans for expansion at Fashion Outlets of Niagara Falls as presented by Macerich. 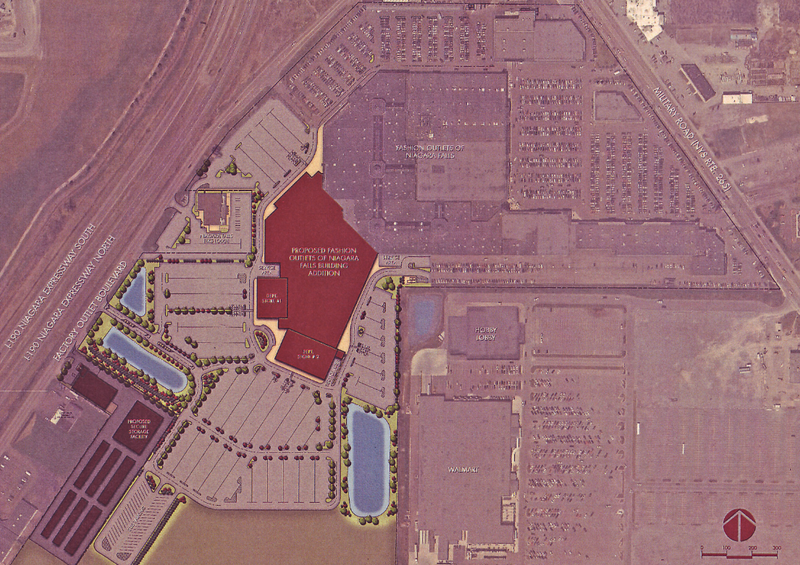 The red portion is the building addition with surrounding parking off Fashion Outlets Boulevard. The purple area to the left of the addition is the current Niagara Falls Elks Lodge. The blue shows retention ponds. Walmart backs up to the retention pond at right. The darker red at lower left is the new location of Secure Storage. New stores, more parking, more space, more jobs - big changes are in store for Fashion Outlets of Niagara Falls. Doug Morrow, vice president of development for Macerich Co., headed a presentation on the mall's plans for expansion at Tuesday's Town of Niagara Town Board meeting. Macerich is a Santa Monica, Calif.-based company that owns regional and community shopping centers across the country. It has purchased the former Sabre Park trailer home area with plans to expand the current mall there. "There's a lot of competition coming up in Canada," Morrow said explaining the need to keep the mall "fresh and new" so it wouldn't lose its market share. "Our goal is to have the expansion completed by the fall of 2014." The Town Board set an additional meeting for 6 p.m. Tuesday, April 30, at which action is expected to include rezoning the parcel at 1705 Fashion Outlets Blvd. for the expansion. The board also intends to be lead agency for the State Environmental Quality Review process. The addition will be connected to the rear of the current mall located at 1900 Military Road. It will include a new entrance off of Fashion Outlets Boulevard where it runs parallel to the I-190 expressway, leading to a new mall entrance with canopy shelter and a generous drop-off space. Today, there are 150 stores at the mall; the plans for the addition include about 50 new stores, with space for two department stores. Tawney Farmer, Macerich's consultant from Stantec Consulting in Rochester, said the existing mall is on 41 acres; adding the Sabre Park property will bring it to 73.3 acres. Added parking will be above industry standard and include an area for 40 bus parking stalls. Plans also include slightly brighter lighting at the mall, and aesthetically, landscaping will make the area "look like a jungle when compared to the existing mall," Farmer said. The Military Road entrance won't be ignored, Morrow said, promising more curb appeal when asked by Supervisor Steve Richards if that would become the back of the mall. Richards went into a huddle with Morrow and Barbara Hathaway, chairman of the town's planning board, after which Morrow said, "The supervisor has some great ideas for traffic control on Military Road that we will investigate." Morrow also said his company is looking into the possibility of building a connecting road between Fashion Outlets and the Walmart property, which could ease traffic on both Military Road and Fashion Outlets Boulevard. In addition to the trailer park, Secure Storage, now near the Sabre Park entrance on Fashion Outlets Boulevard, will be affected by the expansion. Jack Ruh, Secure Storage owner, also was at Tuesday's meeting to explain that his business will relocate on Fashion Outlets Boulevard closer to Niagara Falls Boulevard, which will enable him to put up a more attractive storefront office and have space to expand. Board members concerned about drainage issues in the mall area were told plans include two large retention ponds that will slowly release water, actually improving the current drainage problems. Large storm sewers will be built under the addition. The old sewer line will be relocated to Fashion Outlets Boulevard and connect to the city system, Farmer said. Board members added other concerns and suggestions for Morrow to consider. Councilman Marc Carpenter suggested an added turning lane on Fashion Outlets Boulevard at the new entrance. Councilman Charles Teixeira wanted to know if the retention ponds (four to six feet deep) could become stagnant or collect grit blown from the I-190 and the open area at the dump. He also was concerned about safety and the possibility of somebody pulling up and deciding to have a picnic at one of the ponds and letting children play in or near the water. Morrow said the company had never experienced these issues with the retention ponds in its other malls, and the ponds would be built to DEC regulations. Councilman Danny Sklarski was excited by the possibilities. "Once it's completed it will be the 20th biggest enclosed mall in the nation," he said. "They already have prospective clients for the new addition. That's going to benefit us all!" 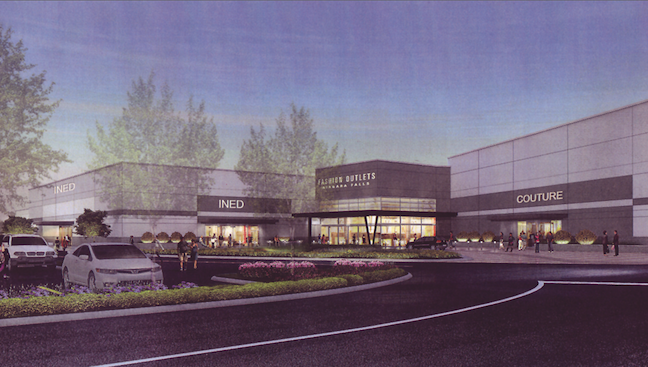 Macerich also provided a drawing of plans for the new Fashion Outlets Boulevard entrance at the Fashion Outlets of Niagara Falls addition.